Colca Canyon: From Chivay to Mirador Cruz del Condor. 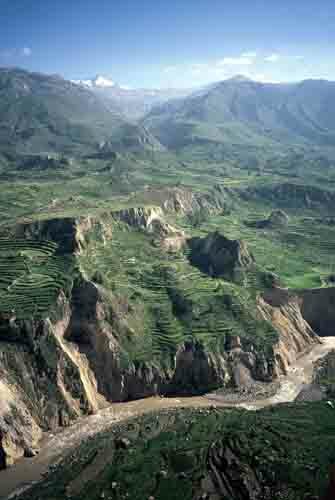 Fantastic landscapes with the ancient terraces. Watching our first condors. Regarding the landscape I can not say much more than spectacular. When I put those reports online I will include photos and I will send you an e-mail as soon as I did so. If you like nature, mountains and hiking you can probably spent weeks in this canyon. Lunch was the usual and mostly successful attempt to take the tourists to a place where everything costs five times as much as in the local restaurants a couple of blocks away. If you go to the latter kind of restaurants you get very tasty food for unbelievable prices, the menu of the day includes a soup and main dish (e.g. Alpaka steak, see below, rice and chips) often something to drink (e.g. Coca tea) and sometimes a simple dessert, in remote regions you pay less than a Dollar. The little hike in the afternoon: Two hours walking through indescribable landscape including the visit of some Pre-Inca Graves, little caves in the rocks, the floor covered by human bones and sculls. The hot springs : Do I have to say more than „tired legs, hot volcanic water with sulphur in an open air pool under a starry sky“? Talking about starry skies: We were extremely lucky with the weather. Here in the mountains is rainy season. 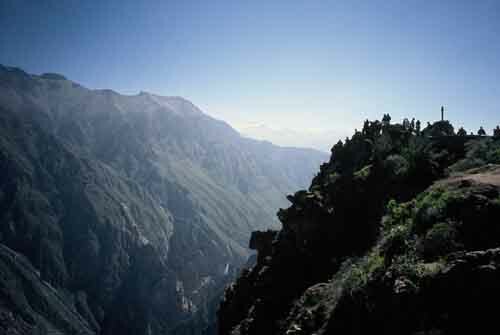 Some travelers have told us that they had nothing but clouds in Colca Canyon, only a couple of days ago. We had almost nothing but sun. Several people told us that the full moon caused the weather change. After a short research on the internet I do not believe this. In the lower, left hand corner of the picture there is a rock which has been used as a model, a construction plan for the terraces. If you pour water on its top you can see how it flows to each of the terraces. The next morning we went to Cruz del Condor, further down the valley. 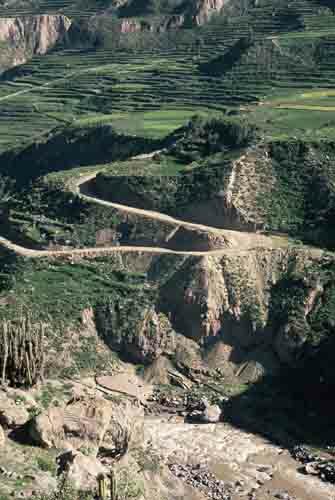 We passed slopes which had been transformed into terraces before the era of the Incas (n.b. 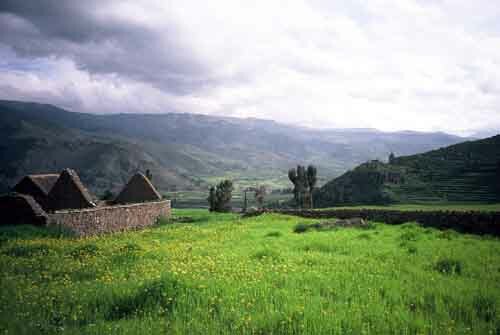 : The era of the Incas was quite late, between the 13th and 16th century, when they ruled wide parts of South America . An article on the Incas can be found at http://en.wikipedia.org/wiki/Inca, but I did not read it yet. Because the Incas were not the first civilization in South America and nobody can remember the names of all those peoples most people use the term „Pre Inca” when referring to events before the 13th century). Those terraces were not only made because cultivating plants is so much easier on flat ground but they are part of a sophisticated irrigating system that ensures that all the fields get enough water. Close to the street we saw a rock which seems to be a model, a construction plan for the terraces. The terraces of the surrounding area had been chiselled into the stone and one can even pour water onto the top of the stone to see how it flows to the different fields (unfortunately one is not allowed to actually do this anymore). Later I had the opportunity to see some parts of this system in action (see below). Does anyone of you know a system which has been build several hundred or even more than thousand years ago and which is still in use? I feel awe and respect for the people who constructed this. Apart from the terraces we saw some Inca nobility graves almost unreachable in the middle of steep rock slopes. A typical condor photo … after you enlarge it digitally. Cruz del Condor itself is a lookout point with a good view into the canyon. February is not the best time of the year to see condors, but we were lucky: After only a couple of minutes one of these mighty birds (wing span up to 3.5 meters) circled a few times over our heads. It is already a kind of mantra in my travel reports: I strongly recommend bringing good binoculars. Of course everybody concentrated on trying to get some photos of the bird but there is no sense in doing that unless you carry a reflex camera with a lens of at least 300mm. If you don’t better focus on enjoying what you see. 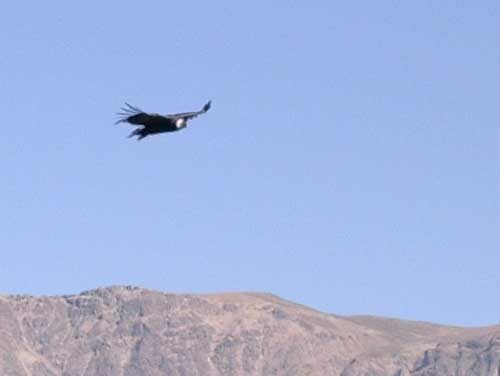 Other than condors we saw eagles and later and in other places a humming bird and two storks.